Following on from my recent experiments with symplocos leaves as a plant source of aluminium for mordanting, I have done some further tests, mainly to try this plant mordant out on silk and cotton fibres. After my last tests, I re-used the 50% symplocos mordant solution on a further wool skein to test whether the solution would still be viable as a mordant and I was pleased to note that, when I added a sample to madder and logwood dye baths, it produced a strong colour. This suggests that the 50% mordant solution could safely be re-used on a further batch of fibres. This led me to wonder whether symplocos would still work if used at a lower percentage, so I decided to use 30% instead of 50%. I also decided to see whether the 30% mordant solution could be used more than once. The main difference between mordanting animal fibres and vegetable fibres with symplocos leaves is the temperature at which the fibres are treated. Wool fibres are heated slowly to simmering point, held at this temperature for about an hour then cooled and rinsed. Vegetable fibres and silk are treated in a hot solution (60C/140F) but not simmered. The vegetable fibres must also first be treated in tannin. I prepared two sample sets, each consisting of wool, silk and cotton fibres, and I treated the cotton fibres first in a tannin solution from oak galls. I then weighed the sample sets and worked out the weight of symplocos leaves I would need for 30% weight of fibres (WOF). To prepare the symplocos mordant solution for all fibres, I simmered 30% symplocos leaves in water for about 45 minutes then strained the solution through a piece of very fine muslin cloth. At this point I saved the used leaves and re-simmered them, so that I could add this solution to the exhaust mordant bath after my tests and then use this on a further batch of fibres. I divided the symplocos leaf solution into two pots – one for cotton and silk and the other for wool. I slowly heated the mordant bath containing the wool to simmering point then held this temperature for about one hour. I then removed the pot from the heat and left the fibres to cool down. The cotton and silk mordant bath was heated to 60C/140F and then removed from the heat. The fibres were then left to soak in the solution for about an hour. 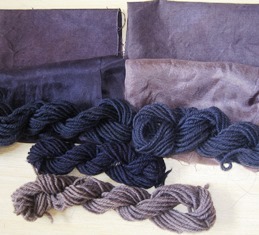 I then dyed the fibres in madder and logwood dye baths. 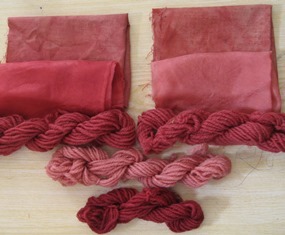 The photos below show the results from the madder extract and logwood extract dye baths. From these tests it seems that using the symplocos leaves at 30% WOF gives good results but that re-using the 30% solution may produce paler shades on some fibres, which could be less fast. Although 30% WOF works well on the first batch of fibres, I think it might be better to use 40 – 50% WOF if one intends to re-simmer the symplocos leaves and to add the solution to the exhaust mordant bath for re-use. This entry was posted on Monday, September 4th, 2017 at 2:03 pm and is filed under Dyeing Tips & Recipes, General Dye Information. You can follow any responses to this entry through the RSS 2.0 feed. Both comments and pings are currently closed.